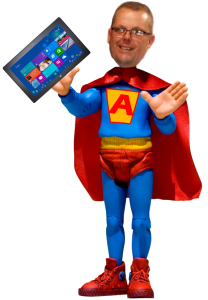 @innovativeteach is my twitter alter ego, But, more recently in the Microsoft in Education world I have been know as the App Man. Some even think I should have a costume! I often get asked what are my top ten for education. ‘Well how long is a piece of string?’ there are so many great apps now in the Windows Store it is difficult to choose. Wordbrush Words have been trapped in straight lines for too long...set your words free! wordBrush allows you to draw text freely on the screen, each letter following the trace of your finger as though you were painting with a brush. Kodu Kodu lets you create games through a simple visual programming language. Kodu can be used to teach creativity, problem solving, storytelling, as well as programming. Physamajig Just sketch something out and it is translated into a realistic physics object. Add attributes such as bounciness, friction, and joints - then create your own games by adding Behaviors to the objects. Skitch Touch Skitch Touch is a free tool for communicating visually with friends, co-workers, and the world. Annotate images with arrows, shapes, text, and more. Use Skitch to sketch something new, mark up maps, screen captures, or even a photo. QR code design made easy! "QR Code Designer"
The only application generating custom-designed QR codes. Project Sienna Microsoft Project Siena (code name) is a new technology for app imagineers. Build Apps and databases without any programming. Educators can initiate formative assessments through quizzes, quick question polls, exit tickets and space races all with their Socrative Windows app. Socrative will instantly grade, aggregate and provide graphs of results to help you identify opportunities for further instruction. Save time and visualize student understanding when it matters, now! Why just read ebooks? When you can create your own! CreateBook is an easy to use App allowing users of all ages to create stunning eBooks which include text, video and a range of other media. The Windows Store is rich in resources for Education, you just have to find them, but don’t just look under the education category, I always use the search function. I may type a word like ‘Science’, find an app that looks interesting, but I have found most of the real gems, such as Wordbrush, from the ‘related apps’ list that the store suggests from a search. ……. and if you can’t find the App you need, then may be your students can build one, like these. You can use our free tools at www.dreamspark.com to do this. If you have any great Win 8.1 apps that you are using please share them, either leave a comment on this blog or let @innovativeteach know on Twitter. thanks a lot. did not know that windows 8 is so awesome!